Sixteen blocks are needed for the MMQ top. These 4 blocks include a simple 4″ square, a modified sailboat block, a shaded 4-patch block and a “W” alphabet block. 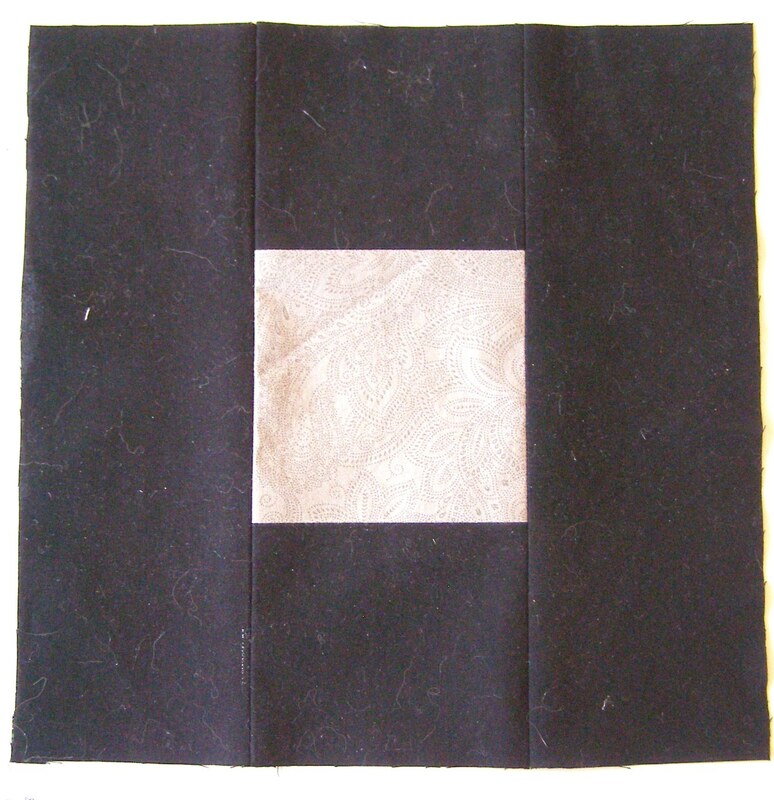 The 4″ square is perhaps the simplest block. 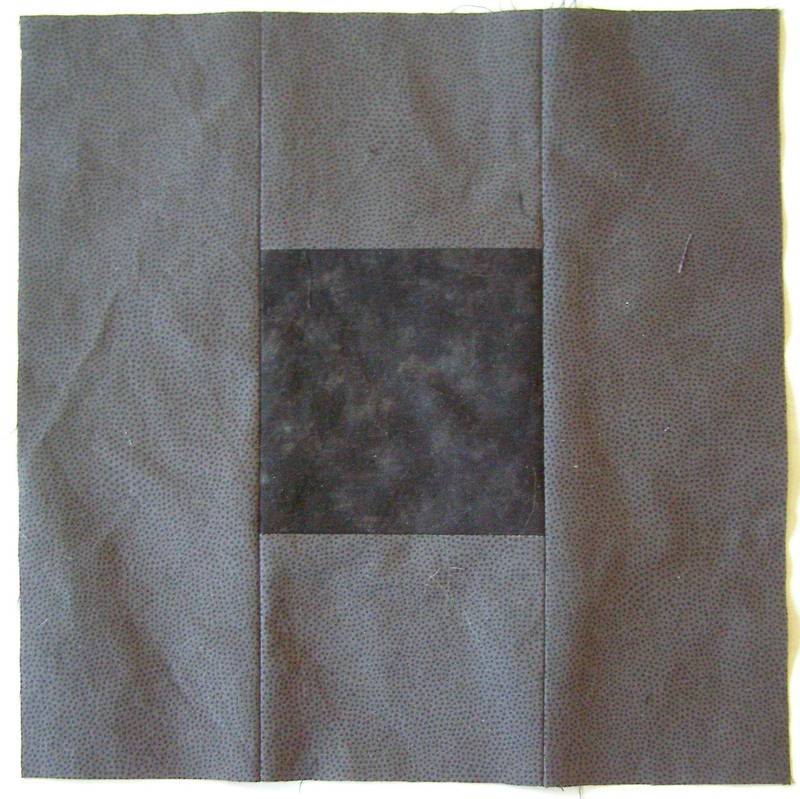 The fabric is machine basted to the graph paper 1/4″ outside the 4″ square lines – and the borders are attached using the same process used for the other blocks. Pinning the center square fabric to the graph paper in at least 4 locations will help as the fabric may slide during machine basting. When complete, this quilt will be gifted to my son. When he was small, I made him a sailboat quilt (blue gingham and calico), and I wanted to incorporate a sailboat block into this quilt. This sailboat block is from Quilting About.com. A beautiful block, its complex design is not in keeping with the “simplistic look” of the MMQ, so a “modern art” variation was developed. 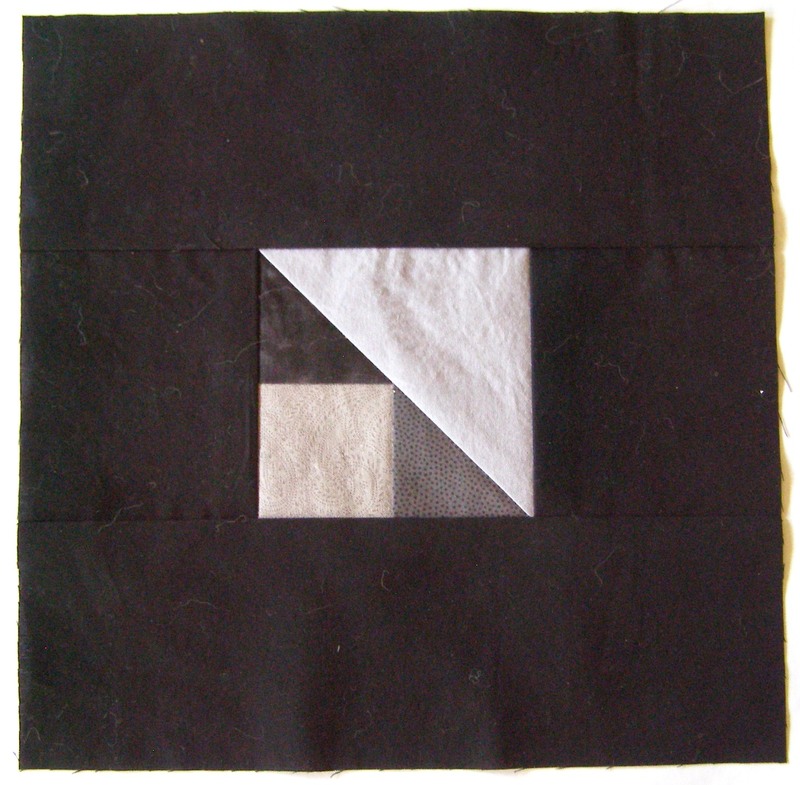 The Paper Piecing Diagram shows the order of seaming for this design block starts with the triangles, then the square, and finally the rectangle. 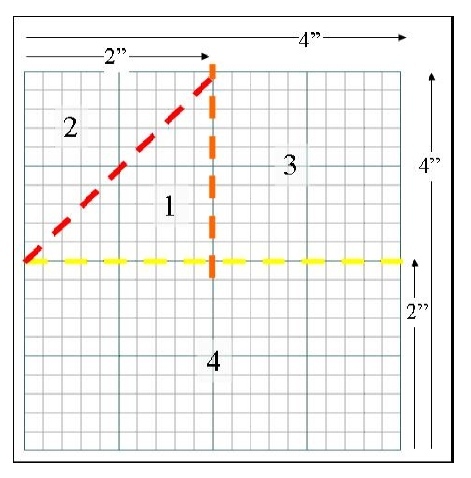 Once the design block is complete, borders are added following the process outlined in MMQ Block 1 and Borders. 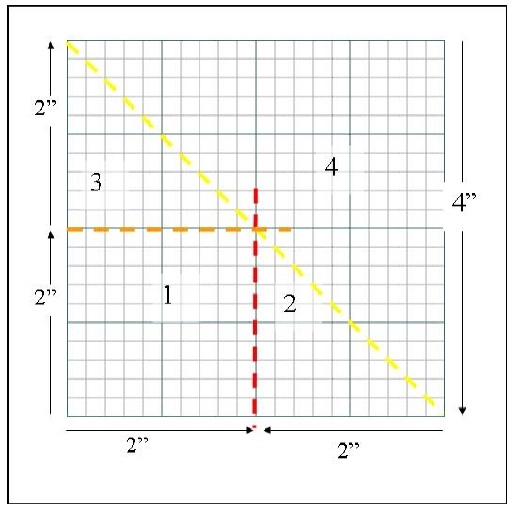 The Shaded Four Square Block is another variation of the Half Square Triangle used for Block 2. 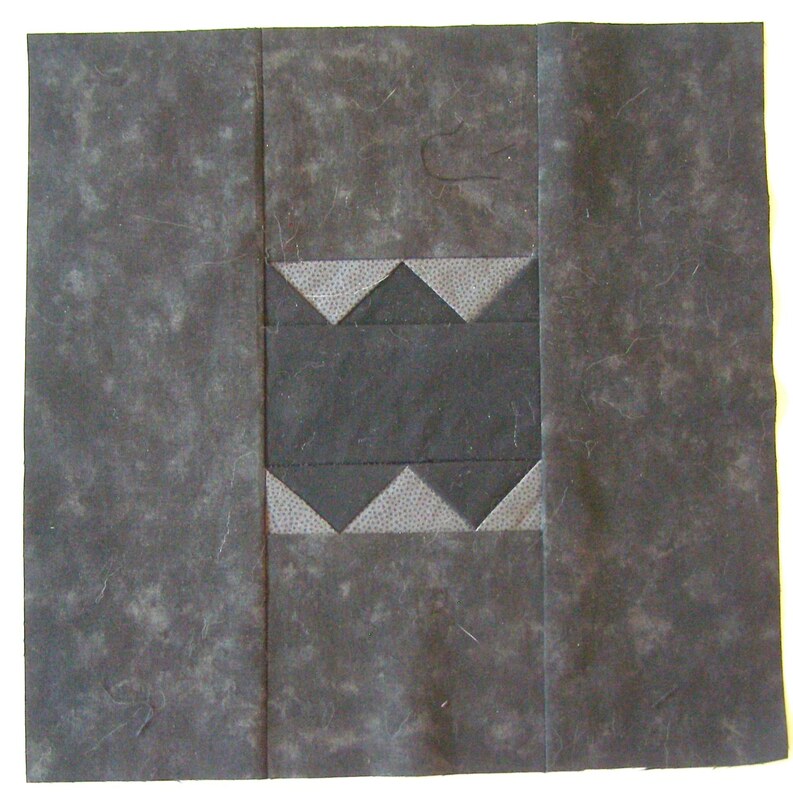 This blogger demonstrates how the same rather simple Shaded Four Square Block can be combined to create very different looking quilts. 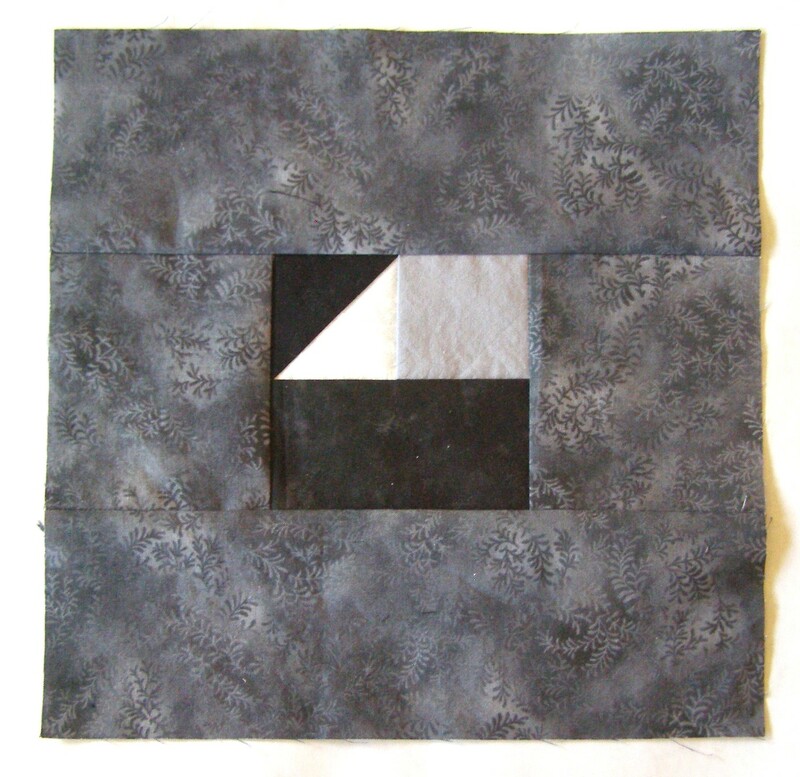 The block is fairly simple to piece using Paper Piecing. It only has 3 seams! Careful piecing and pressing is required to ensure the yellow seam crosses the very corner of the Piece 1 square. Paper Piecing makes that precision easy! Add borders, square up and another block is complete! Personalizing a handmade quilt makes it extra special. A “W” Block was created for that purpose (my son’s first name starts with a “W”). The 4″ center “W” design block was the most complex of all the MMQ blocks. It required assembling three separate Paper Pieced sections – the upper and lower 1″ triangle sections and the center rectangle. While this “W” Block might work for all the Willamena’s, Washington’s, and Wyatt’s out there, thankfully, Quilters’ Cache has a complete set of simple 4″ Paper Pieced alphabet blocks. Just one more Block to Go! This entry was posted in Beginner Sewing Projects, Home Decor, Modern, Quilting, Sewing, Sewing for a Teenager, Stash Couture, Tutorial and tagged How to sew a quilt, How to sew Modern Quilt, Modern Quilt How to, Modern Quilt Tutorial. Bookmark the permalink.